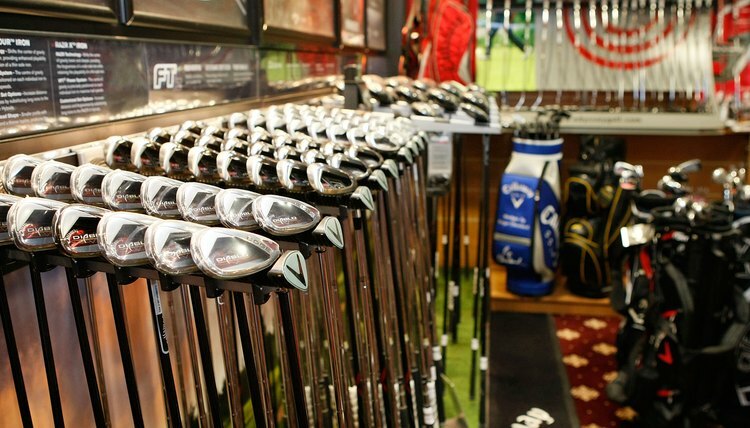 Most golf retailers offer demos for every type of golf club you might need. Club selection is one of most often overlooked elements of golf, with many amateur players underestimating the value of knowing just how long they hit every club, and how the conditions on the course can change those distances. Players that do not know how to choose the right club will find that their approach accuracy is quite low, as they are constantly hitting balls which, even if struck on the right line, travel too short or too long, leading to missed greens or very long first putts. Practice with your clubs at the range, and learn your distances with each club, so you know how far an average shot will go with each. Consider the lie conditions of the ball. A small amount of rough will limit backspin, increasing the distance traveled, while a lot of rough or a ball in the sand will lead to shorter distance as the impact is absorbed partially by the other materials. Check the difference in elevation from your ball to the target. For every 10 yards of vertical elevation, approximately one club must be added if the target is above, or subtracted if it is below. Note the wind, as a head wind or face wind can mean you need a longer or shorter club respectively. Consider green conditions. A soft green, following a rain, for example, will have less roll for your ball, while a hard green, cause by hot, dry days, will roll more. Adjust your club of choice if needed from your default club at the distance based on the above criteria. The more you play, the better you will get at understanding how much of an effect each has on your distance.